I like Edmodo a whole lot but like everything in this crazy life there are some problems or shortcomings to everything and my favorite learning management system (or LMS) is no exception. I sure do wish Edmodo would drive me to work, cook nutritious and tasty dinners, grade my papers, and of course iron my clothes (I don’t mind doing laundry). Alas, I fear those features may never come to fruition but Laurie asked a good question about how to create assignments ahead of time and then roll them out when you need them. Good question Laurie! Read on past the break to see the work around. I have recently set up an Edmodo account through my school which I would like to use for a course I teach. I read your Edmodo tip manual where you invited questions, and so I am indeed taking you up on the offer and hoping for answers, maybe even before the school year begins. I have worked all morning on turning the 3 main assignments for our Grad Transitions 12 course into fillable PDFs and wanted to load these onto my Edmodo site for students to access. I am not sure what I am doing wrong, but I went to my page, clicked on “Assignments”, wrote the description for the assignment and then naively clicked on “Load Assignment” thinking I could browse my computer files and attach it that way. I know now, it doesn’t work that way. I then attached one of the assignments as a file, set a due date, but then didn’t see how I was supposed to save it. I went to your tip guide to see if there was something there to help me out, and by the time I went back to my page, no assignment was listed at all. Is there a saving function I need to perform? How can I create the other two assignments and attach them? Any help you can off is greatly appreciated! 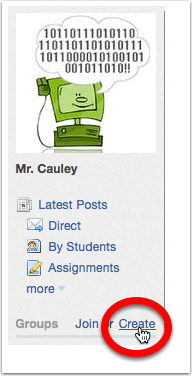 This is definitely a feature that many Edmodo users are eager to see added to the site. Competing sites like Schoology, Edu 2.0 and probably more already have this, but it is hard to beat Edmodo’s simplicity and intuitive user experience. Anyway, enough of this rambling here is the work around. It is not perfect but it works. 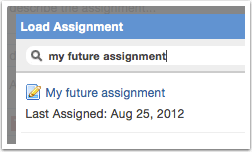 Edmodo – Assignments for the future! 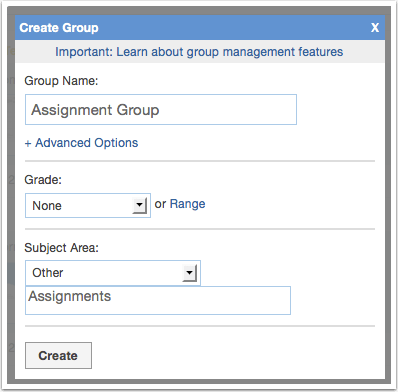 Step 1 – Create a group just for your assignments! Click on Create and make a group for all your assignments. This group will have no members in it. It will only house your assignments. We have to do this because once an assignment is created and assigned to a group it will be remembered by Edmodo and you can Load that assignment and assign to any other group you want anytime you want. As you can see here, I created my group Assignment Group and said it is not associated with any grade or subject area. Step 2 – Start cranking out those assignments! Now it is time to create those assignments. Be sure to make sure that you assign it to this group only. Also be sure to hit the Send button. Without that small but vital step you will lose your assignment and have to rewrite it. Let me tell you that is a real bummer. Here is my assignment. Now that it has been assigned to a group I can load it anytime I want in the future. Handy no? Now it is time to load up that assignment. You will have to hit the Assignment button first, then hit the Load Assignment button. Search for your assignment and then select it. Assign to whichever group you chose and hit Send. Voila! You’ve done it! Congratulations! It is important to note that you should never delete your Assignment Group. If you do, you may run the risk of deleting the files/assignments/quizzes that are associated with that group. Once a group has been deleted there is no getting it back or the information that is found there. If you feel the need to hide it, then you can always archive it. This entry was posted in Edmodo, Patrick Cauley and tagged edmodo assignments, questions about edmodo. Bookmark the permalink.